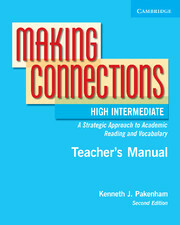 Making Connections is a reading-skills series aimed at students who need to prepare for college-level academic reading tasks. The series has three levels: low intermediate, intermediate, and high intermediate. At each level, thematic units provide high-interest readings and present key academic readings skills and strategies. Reading-skills and strategies sections are woven throughout each book, giving students insight into how academic texts are organized and how to read effectively. Readings begin with pre-reading tasks and end with a post-reading section that takes students Beyond the Reading, allowing for Internet research, discussion, and writing. A strong vocabulary development program runs throughout the series. Get an eSample of Making Connections that will allow you to view a product preview on your desktop.